Home / Uncategorized / Your Brain is Listening-how written images can be a key to improvement. Your Brain is Listening—how written images can be a key to improvement. Have you noticed how an old photo or letter can instantly take you back to vivid memories and feelings from that time? For example, a friend sent me this photo. 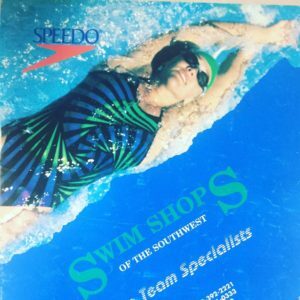 I am on the cover of a swim catalog—and after more than two decades, I can tell you where I was, and what was going on in my life based off of the memories associated with that image. If you were to just ask me what I was doing on any given date, I would not be able to recall anything. It is the image that anchors the memories and the recall. The brain has an amazing capacity to deep-store impressions. It is quite a scientific fact. Not only does your brain do this with memory in looking back, but it can also play it forward with visualization. How does this apply to swimming faster? It does because your brain is listening to what you are saying and doing, and if the visual and physical cues are strong enough, your brain will embed the experience. Conclusion: There is power in writing things down and organizing a goal. The effort of recording and planning is something the brain listens to and uses to aid future performances. 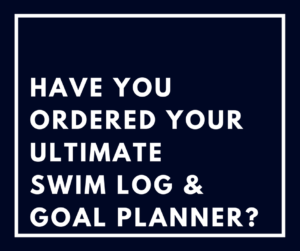 For that reason, The Ultimate Swim Log and Goal Planner has been a lifelong project of mine to help empower swimmers take ownership of their swimming and have a tangible record of that ownership. Our world is increasingly more focused on the digital and ephemeral. Chats disappear. Data is stored away. Information is “out there” but invisible, and the connection of an experience is not as impactful to the brain as physically putting something on paper where you see it everyday. Our brain wants information it can use that is a whole sensory package –an image tied to a physical response. 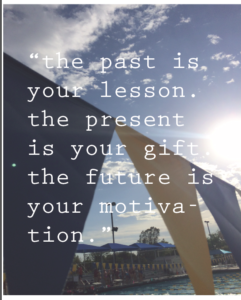 I discovered this connection when a coach took the time to teach some elements of goal planning and goal visualization as a part of our age-group training. At his suggestion, I began to write down goals and log practices. By college I had determined to visualize a perfect 100 freestyle race every day, the whole season, before the competition. I even made a homemade paper scoreboard with the time I wanted to see on the actual scoreboard when I finished that race. I taped my artful rendition on the wall to see it every day, and visualized how that race would feel each night. 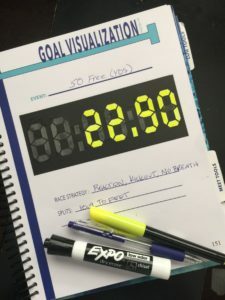 An amazing thing happened at my championship race—I went the exact time to the 10th of a second that I had drawn up on my own paper scoreboard. Apparently my brain was listening to my visualization, recognized the plan, was familiar with the desired result, and steered towards that same result in real time. Write down your practices, or best sets each day to help your brain remember that it has worked hard and doesn’t need cave to nerves. Your brain will know your body is prepared. Write down your total yardage as a visual cue to show how you spent the hours, days, and years striving to be better. Your brain knows it has done the work. Write down your best times to show a pattern of improvement which develops a confidence in the future. Your brain knows it has hit important milestones. Write down your goals to give your brain a chance to figure out how to get there. Your brain will steer towards that visual for you. Write down your strategy to set a course your mind will use and follow. Your brain has a road map that it can follow. When you write down goals, you make the invisible visible, the intangible tangible, and your brain will process it as a reality. Think of writing things down as a scientific relationship of success between your brain and your journey. Draw out your goals…your brain is listening to all of it. Celebrate your victories small and large…your brain will love it and your future self will thank you with great memories. 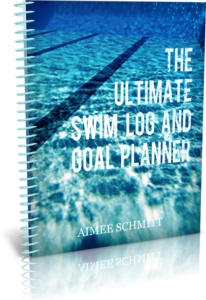 Aimee Schmitt is a former NCAA All-American swimmer for Stanford University, author, and avid believer in goal-setting.